"Going forward all tweets will [be] by Honest Toddler’s black a** mom." The "Honest Toddler" — who voices their outrage across several wildly popular social media accounts with more than one million combined followers — has had to put up with a lot. Having to stay in bed until sunrise. A granola bar that broke in half. Toast without enough butter on it. But, after years of bemoaning injustices of childhood, "Honest Toddler" finally snapped. Seemingly in response to allegations of sexual misconduct against comedian Louis C.K. 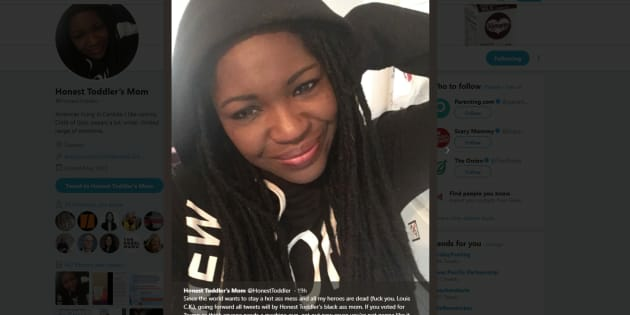 — the latest in a growing list of allegations against Hollywood stars —"Honest Toddler" founder Bunmi Laditan pulled back the curtain and started tweeting as herself Thursday afternoon. Montreal mother Bunmi Laditan, who is also the author of Confessions of a Domestic Failure, has typically not shied away from speaking out in the past. Using her trademark dry humour and wit, Laditan picked a public battle with her child's school in August over the amount of homework given, and in October she revealed she'd been suffering from postpartum depression for three years. After taking over the "Honest Toddler" twitter account Thursday — even changing the name to "Honest Toddler's Mom" and swapping out the old profile photo of an image of animal crackers to one of Laditan's own smirk — Laditan tweeted out her opinions on U.S. President Donald Trump, Louis C.K., and the backlash against NFL players who chose to kneel during the national anthem. The irony of anyone calling themselves pro-life but being angry at a kneeling NFL player asking for their life to be valued above a flag will never stop baffling me. Laditan also confronted those who questioned whether she was worried about her fanbase, ruining her career, and even whether she was intoxicated. I had someone ask me if I'm worried about my career- the ramifications of alienating members of my audience. No. Most of my income comes from books I've published anonymously. I prepared for this moment. Plus I have very cheap taste in clothing, accommodations, life in general. "Are you worried about numbers?" At this point in my life, I'd rather be seated at the sparse booth with a good vibe than a banquet table with a shady one. I find it utterly reprehensible that when a woman breaks from the script/societal expectations the first assumption is that she must be under the influence of an intoxicant, but yes. Kidding! I had one lunch beer hours ago. If you're unfamiliar, a lunch beer is a side dish. Whole grains and what not. Read about it. Responses on Twitter, however, were largely positive. Yessssssssssssssssssssssssssssssssssssssss. Though I'll miss the toddler tweets, looking forward to this. On Instagram, in response to someone assuming she'd been hacked, Laditan responded in typical fashion. "Just fresh outta f*cks and want to be 100% myself."